Obama Creates New Records on Twitter and Facebook – Just after winning the race for president, Barak Obama setup world records on Twitter & Facebook. 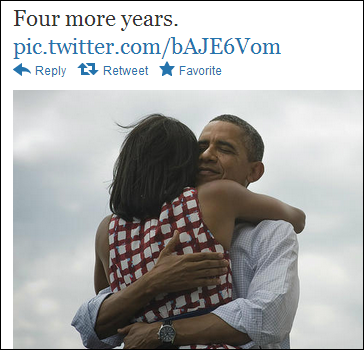 His tweet “Four more years” re-tweeted more than 770K times and his Facebook post received 3.8 million likes. Twitter Kills the Fail Whale, One Tweet at a Time – Twitter handled insane user loads with millions of tweets related to election and proved that it’s platform is now more robust than ever. In a post on the company’s engineering blog, Twitter said people sent 31 million election-related tweets on Tuesday alone. From 8:11 p.m. to 9:11 p.m. P.S.T., Twitter processed an average 9,965 tweets per second, with a one-second peak of 15,107 tweets per second at 8:20 p.m., the company said. Inside the Secret World of the Data Crunchers Who Helped Obama Win – Team Obama used big data and analytical systems to win the elections!! Barack Obama Goes On Reddit For Last Campaign Stop Of Political Career – Reditt is getting a lot of Obama’s attention these days. He is quite often stopping by Reditt to say hi to the nerds & geeks hanging out there. His chat with nerds on Reddit has paid rich dividends.